The sight and sound of a Supermarine Spitfire remains unmistakable today just as it did to pilots 75 years ago. UK engineering company Trig Avionics are proud to announce their support of one of the most distinctive and unique Spitfires flying in the UK. She flew over 176 operational missions including the first D-Day combat victory over the Normandy beaches. Spitfire Mk. IX LF – ML407 has a distinguished wartime record. The post-war story of ML407 is almost as dramatic. The 1950’s saw ML407 converted by Supermarine for the Irish Air Corps into a two seat trainer. Retirement from military service and the placement in a museum did not bode well for the future of ML407, but it was rescued from oblivion and lovingly restored to flying condition by Nick Grace in 1985. 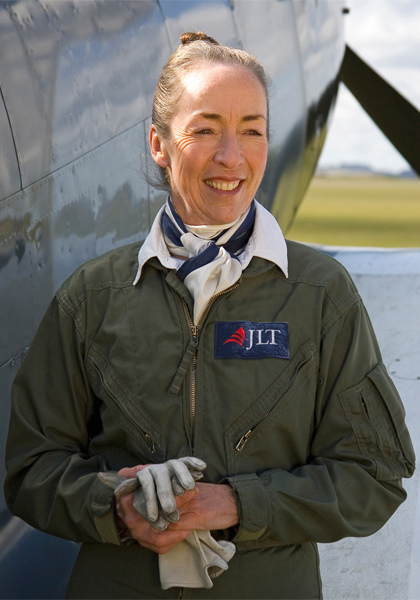 Following his untimely death in 1988 the aircraft is now flown by his widow Carolyn Grace, one of the only qualified female Spitfire pilots in the world. Trig, who manufacture their products in the UK provided a TT22 Mode S transponder which was recently installed into the cockpit of this ‘old lady’. The Spitfire will now enjoy enhanced visibility to air traffic control, smoother access to airspace and a reduced cockpit workload for Carolyn. Carolyn said, “ML407 honours a brave generation and I consider it a privilege to display to the public this wonderful aircraft that has become a legend. Our winter maintenance programme gave us a chance to fit a Mode S transponder. I’m impressed that the Trig unit was easy to install, it takes up very little space in the instrument panel. Warbirds don’t have much room for avionics, so the separate transponder hardware is installed elsewhere in the airframe. The controller unit is small and discrete, in keeping with ML407’s original wartime instruments, so it looks great too”. Andy Davis CEO at Trig said “We’re very happy to support Carolyn, we recognise her hard work and commitment keeping ML407 air worthy and in the public eye. It’s exciting to have a TT22 transponder fitted in such an historic aircraft. We wish Carolyn and her team success in her next display season”.